The application for the Department of Economics’ undergraduate scholarships will run October 1st, 2018 through October 31st, 2018. 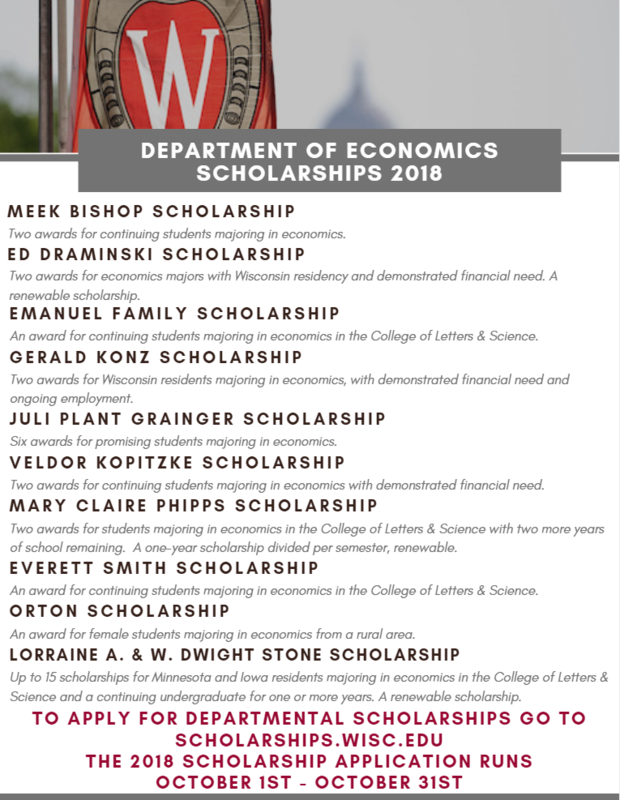 Thanks to our generous alumni, the Department of Economics can offer the following scholarships to deserving undergraduate students majoring in economics. More detailed information about each scholarship and the application forms can be found online on the Wisconsin Scholarship Hub (Wish). Questions can be directed to Alissa Wilson, alissa.wilson@wisc.edu. Click the “sign in” button on the top right corner and sign in using your net ID and password. Complete the University’s General Application. After completing the University’s General Application you will be provided with other scholarship opportunities that you qualify for. This may include an application for study abroad scholarships or if you are a student in L&S, the 2018-2019 College of Letters & Science Continuing Students Scholarship Application. You do not need to complete these applications, but we encourage you to do so. To find the Department of Economics General Scholarship Application, select “Other Recommended Opportunities” after completing the University’s General Application. 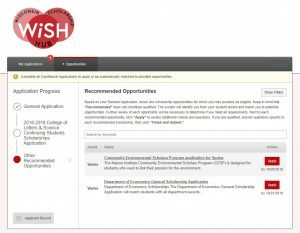 Click the red “Apply” button to be directed to the Department of Economics General Scholarship Application and start your application!